Submitted 2 years 5 months ago by WildCoast.Com. This is an excellent article by Roland Giesler, written in 2014, with facts about the fuel levy. 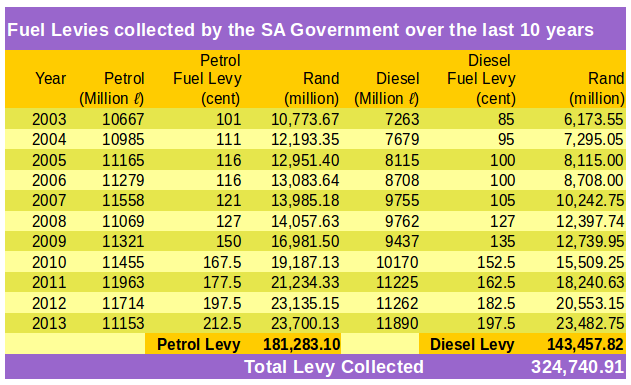 Update: They have finally indicated that an additional R3.65 added to the fuel levy would have to be implemented as an alternative to tolling, thus bringing the fuel levy to R5.77 per liter. 2. Various parties have mounted legal challenges to the Gauteng Freeway Improvement Project. OUTA and the DA have taken the matter to court, but to date have failed to make convincing enough claims to stop the projects. 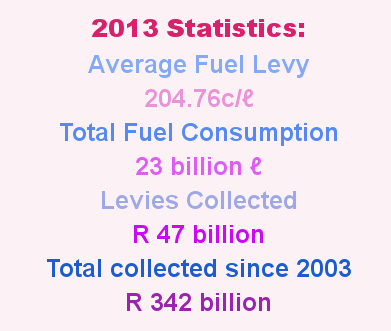 I have often asked myself how much money the state collects via the fuel levy and haven’t heard much comment on that. (update: Outa has done so since the first version of this post) However, this comment on MyBroadband on the matter of conventional tolling of the Western Cape’s freeways, made me decide to analyse the situation to get some clarity. Minister Peters also recently said that the backlog to fix South Africa’s roads is R197 billion. We don’t know what that is based on and that it’s probably wrong, based on the the other Peters track record. But, for the sake of the argument, let’s assume a 50 year loan for that amount (@ 8.5% as per the world-bank rate for South Africa). That would cost R1.415 billion per month, or R16.99 billion per year to pay back, leaving R30 billion for ongoing maintenance and new projects not included in the R197 backlog. 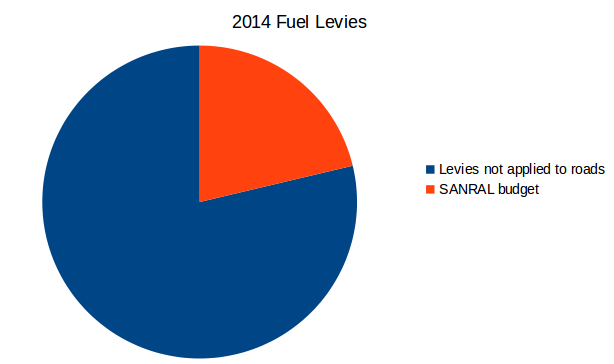 The Ministry of Finance assigns less than 22% of the fuel levy to the purpose for which it was collected. 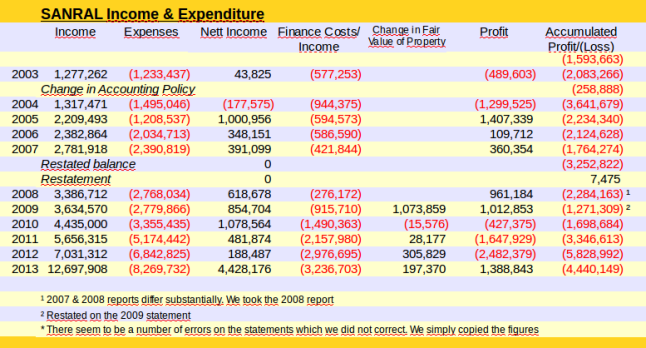 Furthermore the government pension funds risks “investing” in SANRAL in lieu of the GPIF tolling project. Only once, in 2003, was there a one month statutory appeal period to register objections to the Western Cape N1/N2 Toll Road project, the appeals which minister of transport summarily dismissed. What is going on here? Surely a legal challenge to the misappropriation of funds can be mounted and the effects thereof reversed? After all, it was Barend du Plessis, under the “dreaded apartheid regime” that instated this fiscal travesty by dumping the fuel levy into the fiscus, ending the road fund (the South African NP government was facing serious financial problems at the time). In effect he raided the road fund. Exactly what the South African ANC government is now doing.South Africa, by way of it’s road users, has paid R324 billion to keep its roads in good shape, yet the Government has thought it totally in order to misappropriate R224 billion (that is R 224 000 000 000) of that money. To add injury to insult, it now wants to collect more than R1 000 000 per month from the Gauteng freeway users alone, to “cover the debt incurred to upgrade the Gauteng Freeways”. How will this be stopped and reversed? Will OUTA, the DA, Cosatu, the EFF and others take on the Ministry of Finance and it’s sinister plot to double-tax us continuously? Or will the people of South Africa take matters into their own hands as the people of Brittany in France have? In 2010, it seems, the idea of a dedicated road maintenance fund was put forward by S’bu Ndebele, transport minister at the time, although it seems the DA had been promoting the idea for some time before. So if this is being planned, why is SANRAL forging ahead with its tolling regime? There are those that claim this is part of UN agenda 21. Watching and reading about it, does seem to make some sense, in a bizarre way, of what SANRAL and the ANC are doing, but please decide for yourself. At least it seems there are people brave enough to come forward and spill the beans! South Africa’s ruling party is making a grave mistake if they think that they can continue on this path of reckless unaccountability in the face of the South Africa’s people. In the words of an old “struggle stalwart”: Enough is enough!